yes, yes, as mentioned in the preview of this recently, I'm só guilty of wandering off with this :D.
but it was guiltfree and great fun. Yesterday I could finally finish two things for this scene that had been ready for a while, but I hopelessly failed at that, haha. Won't be able for a while to do it the right way, so here it is without after all. You won't miss them and I'm so satisfied with the whole scene that I don't either :D.
I have no clue why, but some months ago I suddenly remembered I still had some test-pieces of different stainless steel contactpaper meant for a second hand 1:1 fridge once. 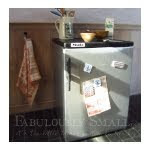 And thought it might be great to use for this mini-fridge that I ordered a few years back for the Oldtique Store. And I just hád to see if it would work :D. The first one I tried that made the most sense, was too bright or something. It just didn't work for me, so off it went. But the second one was perfect! installing a light was inspired by Josje, who had done that in her mini-fridge and I thought was a great idea. It was also surprisingly easy to do and it already had a nice compartment for it. later I made the top and bottom black, and some additional changes like putting in 'glass' shelves* I gave a silver rim (ultra bright chrome bare metal foil that sticks on it's own, but you could also glue on some aluminum foil) as I did with the vegetable drawers and doorshelves inspired by my RL-fridge and made a new door handle (that broke in a couple of places putting it in the slot that I had cut for the handle it came with, but later decided it was to bulky, which is why I made this one. That's why it's not the neatest job, but still like it!). all to bring the nice classic fridge but with some bulky details, to a more realistic modern one. and I printed some nice flooring, a wall and vertical planks for a quick and instant scene. It was much fun gathering the other stuff for this scene, things I collected over the years, but never had been able to use in a scene before. The dishcloth is one I printed years ago after one of my mother's and just needed being fixed like it was hanging as natural as I could get it. the cartons are all templates found with Google (searched for templates of milkcartons and/or cartons). And you shouldn't look too closely at the cans, they're just props so I kept it simple and quick (they also don't have bottoms ;), luckily the labels (decals) make them quite convincing). As is the lettuce in the drawer, that's just 3 printed of the same lettuces found online and glued to a little ball of aluminum foil in a piece of plastic wrap. the margarine was a little less quick, is not varnished yet and painting the rim is not very good/smooth (trust me, it's worse than the photo's indicate), but my hand was shaking like a leaf in the wind again. But it's still a nice little prop :), a big thanks for the inventor of decals! the orange-juice in the glass bottle is actually that, the yoghurt in the bowl is real, the jam/marmelade in the smaller bowl too. 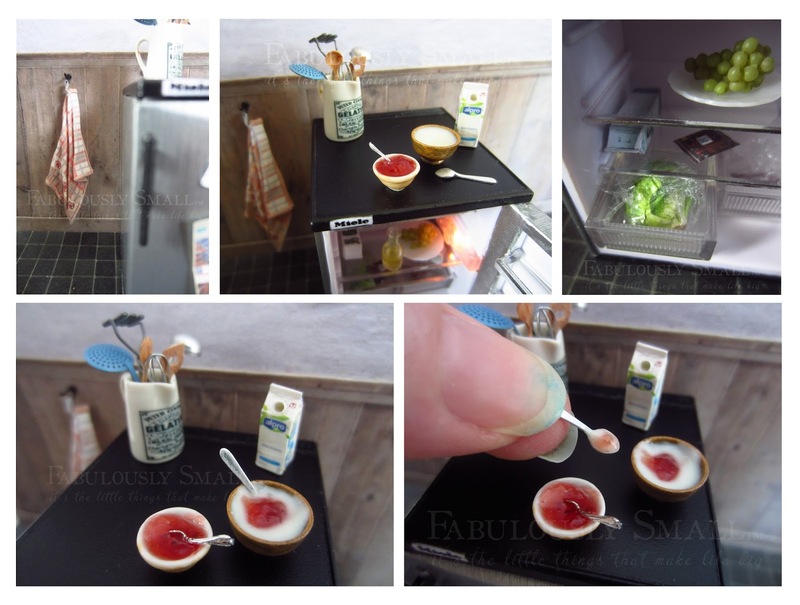 Where props in photoshoots are usually fake for ease and convenience, mine are most often real for the exact same reason :D.
La nevera te ha quedado genial!!!!! Y me encantan todos los pequeños detalles,como la etiqueta del trapo,la mantequilla,yogures...es una escena preciosa!!!! Gracias por su respuesta entusiasta Pilar, muy agradable! As always.... Another wonderful miniature. I like the stainless steel you added and the handle. I love the glass shelves too. The shelves the fridge comes with are really unrealistic. I am going to order the fridge and cover mine to blend in the the English cabinets I am building. It will just look like another painted wood cabinet until you open the door. I too love the light idea Josje had. Thank you so much Catherine! They are very unrealistic, it's just funny. But to be fair, it's meant for children ;). Good idea, I'm looking forward to see it, but I'm sure it will be lovely and it's great to see all different kinds of ways this fridge can be used. In many styles and homes, just like a RL-fridge can :D.
Una buena reforma a la nevera. Está estupenda con la luz. Lo que me ha dejado con la boca abierta ha sido la etiqueta del paño de cocina. Genial!!! Gracias Isabel, eso es muy bueno escuchar! Hi Monique! Dit is wéér echt Monique-miniatuurwerk, prachtig gedaan en zo ontzettend realistisch, écht knap, joh! Die Miele koelkast is idd een hebbeding, leuk zijn die dingen, hè?! En jij hebt hem op een knappe manier opgepimpt tot een meesterwerkje van jouzelf. Toen ik de foto's zag van de yoghurt, dacht ik al: dát is vast echte yoghurt, superleuk en lekker knoeien om dat spul in dat kleine kommetje te krijgen en (totdat je tevreden bent met het effect) iets ervan op zo'n piepklein lepeltje te doen ;)! Maar dat lusje aan de theedoek slaat voor mij alles, zó klein en perfect leesbaar, zoiets bereik je toch niet met een inkjetprinter, tenminste ikke niet ;)! Bedankt voor je tip voor mijn kikkerprins zijn voorpootjes. Ik werk idd meestal met een ijzerdraad frame als de dieren wat groter zijn, maar deze is amper 1 cm en toen was zelfs het dunste ijzerdraad wat ik heb te groot voor zijn voorpootjes ;)! Maar alsnog reuze bedankt voor het onder mijn aandacht brengen hiervan, want ik leer nog steeds heul veul bij. 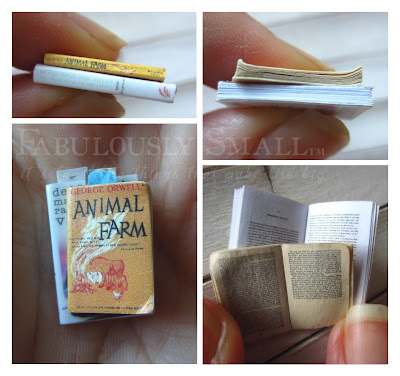 Ik ben ontzettend leergierig, ik vermoed dat ik dat altijd zal blijven doen, want dat 'leren' is nu juist voor mij de kick van het maken van miniaturen LOL ;D! Dank je wel Ilona, dat vind ik een erg leuk compliment! Heul erg leuk die Miele dingen, ik heb ook de magnetron, de vaatwasser en de wasmachine, echt grappig met de geluidjes erbij :D.
De yoghurt was eigenlijk supermakkelijk, met een roerstaafje wat uit het pak, in het schaaltje en klaar. Meer kon er toch niet mee, het zakt meteen waterpas, haha! Het lastigste was wel dat de schaaltjes met yoghurt en jam nogal eens omvielen en dan moest ik zonder dat ik eronder kwam te zitten ze voorzichtig opwippen, maar ging ook best eigenlijk. En ik moet altijd snel iets doen als het al kan, dus met lepeltje gewoon in het schaaltje en foto maken :D.
Haha, jawel hoor, echt met een inkjet huis-printer. Wel een goeie (een office pro) en ik maak mijn plaatjes met heel veel dpi (plaatjes laden en/of opslaan duurt bij mij dan ook altijd lang en is om die reden niet altijd handig!) en het is speciaal decalpapier dat veel scherper print dan gewoon decalpapier. Dus het kan wel, maar wel met de nodige opmerkingen. Ah ja, ik wist dat die heel klein was, maar denk natuurlijk niet over de beperkingen mbt ijzerdraad, haha. Heb wel een tip voor je, want je hebt wel ijzerdraad dat dun genoeg is (volgens mij) alleen heb je daar (denk ik) nog niet aan gedacht. Ik hoop het, ik laat het weten op je blog. Ik herken dat, ben zelf ook nogal leergierig en is idd wat deze hobby zo geweldig maakt en nooit zal vervelen :). Haha, giga is my middle name :D, goeie week! Thank you Claude, that's so nice to read! Hi Monique! I'll have a spoonful of that yummy looking yogurt! LOL! 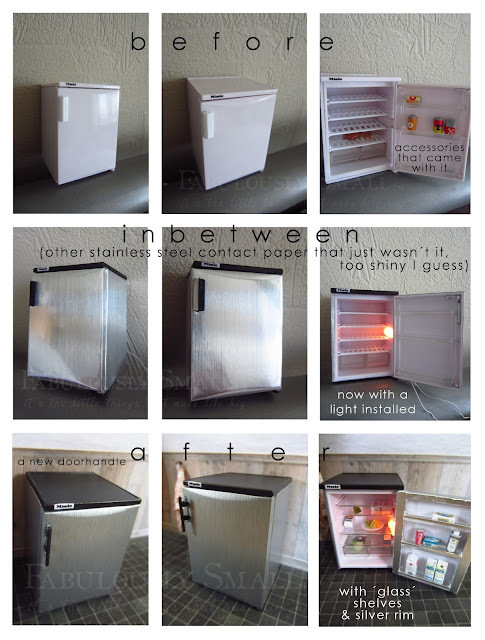 Your little fridge is an inspiration! I have some very "American" fridges in my houses, but I have done Nothing to make them appear more real! This gives me some ideas!!! I Love the idea of the light... I saw that on Josje's blog too! I need to locate some contact paper and the clear acrylic sheets... I am learning!!! Thanks for sharing your sources and techniques! I would not have thought of aluminum foil....! Hi Betsy, oh but please, have some, it IS delicious! Haha, in the future we might be able to have a taste of something on the other side of the world, but not quite yet :D. I'm so happy to hear you can take my ideas for your fridges, sounds good! You are so welcome, it's so nice to be able to help others, like I'm happy to learn from others too. I love Miele, I love your fridge, and that tag! Sometimes they make mistakes at the factory and you find these as seconds in the discount shops :D Great work! Hi Monique, I'm just amazed by the detail in this scene. I think my favorite is the typical Dutch tile as magnets for the fridge! Thanks for sharing also the shop info, living in Netherlands, I didn't know about that one yet. Great work! The fridge, with lights in, is a brilliant piece of work. Amazing work! thank you so much Drora, that's so nice of you to say! Amazing! Now the fridge is perfect. 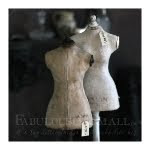 Thank you Fabiola, that is a great compliment! 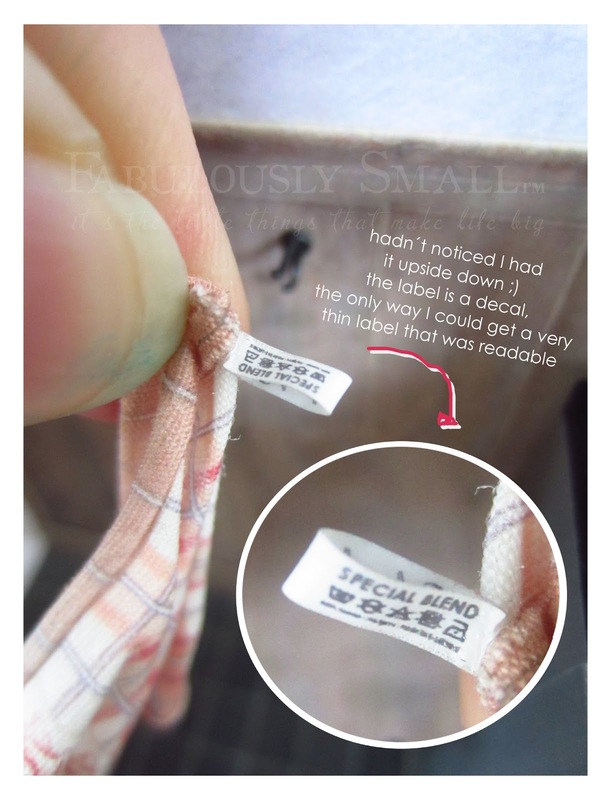 Beautiful post, all things are very well done , especially the kitchen towel with the label - mastery!! Thank you Magda, I feel flattered! Thank you for the great post. The fridge is wonderful and the light really make sit come to life. the drawers and shelves are lovely and incredibly realistic. Great work! Thank you Giac, that's so nice to read :D! Perfect! I love the details you added to the fridge and LOVE the little tag on the tea towel! Thank you, that's great to read! Ooooh wat is ie leuk geworden! Lekker modern met zo'n chroom look. Ik was net Catherine's blog aan het lezen en zag dat ze geïnspireerd was door jou. Dus kwam ik direct hierheen, haha! Ik zag mijn naam ook nog voorbij komen...ja het lampje in de koelkast...Die koelkast heb ik al heel lang geleden gemaakt, voor een ander project. Project heb ik niet meer maar de koelkast -hoewel een tikje grof- vond ik wel leuk dus die mocht in de keuken van mijn poppenhuis. Voor mijn tweede poppenhuis wil ik eigenlijk zo'n grote maken, misschien een tweedeurs. Ik weet alleen niet waar ik hem moet laten. Die theedoek met label vind ik zooo leuk! Wil ik ook!!!! ;-) Dat heb je wel heel klein weten te printen! Misschien heel stom maar ik weet eigenlijk niet hoe je met decals moet werken. Ik zal er eens naar op zoek gaan online. Great project and beautiful job! Can you give us more info on the decals? Hi Martha, thank you! 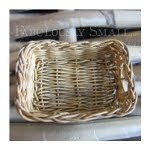 I've given some info in this blogpost http://fabulouslysmall.blogspot.nl/2015/07/to-read-or-not-to-read.html , I think that's what you mean? Or do you mean how to use them? In that case: they are supereasy: print, sprayvarnish the print(s) (the decalpaper I use doesn't need that, but regular ones do, to seal the ink before putting it in water to release the decal) and put them in water per instructions that come with the decalpaper. All you need about using them comes with the decalpaper and is widely available on the internet! Good luck! Thank you, Monique! I am anxious to try this decal technique. I am so impressed with your work. I found the Miele mini fridge on line and it will be perfect in a weekend retreat that one of my granddaughters and I are working on. Thank you for sharing so much! You are so welcome Martha! It's a lot of fun to work with decals, they instantly give something realism. How great that you found a Miele minifridge, enjoy using it, it's so much fun you do that with one of your granddaughters :D. And if you come across any problem or whatever, please don't hesitate to ask, I'd be happy to help if I can!